Recently, I have had to build an app (download link) that required the user to choose a photo from their photo library. Rather than just throwing up a UIImagePickerController like many apps, I decided to add a little bit of style. Being inspired by Over’s ultra simplistic (and beautiful) photo selection interface, I decided to fancy things up a bit. 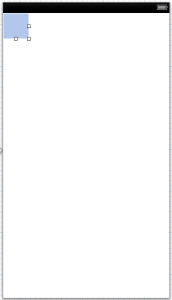 For this tutorial, I will start with a Fresh iOS6 View-Based application that uses Storyboards and ARC. Also note that I will be optimizing for the iPhone 5 resolution. You are free to make the tweaks necessary to deploy on the iPhone 4 and 4S. This will declare the IBOutlet needed to hook up the main UICollectionView that we will be using to display the user’s photos. I have also set up our class to be a UICollectionViewDataSource, UICollectionViewDelegate, and UICollectionViewDelegateFlowLayout. This is necessary when interfacing with the UICollectionView. Open up MainStoryboard.storyboard and drag a UICollectionView on to your view ensuring that it stretches the entire screen. Then, Control-Click and drag from the UICollectionView to your ViewController Object and set it as the delegate and datasource. Finally, Control-Click and drag from View Controller to Collection View and selected collectionView to make the IBOutlet connection. Now, we need to give a Cell Identifier to the UICollectionViewCell so that we can reference it in code. Click on the default cell inside of the UICollectionView and open the Attributes Inspector. For the Identifier type in PhotoCell. The cell might be a little tricky to see as its background color is clear, but it’s there. Simply click in the top left corner of the UICollectionView. Now that the UICollectionView has been set up, it’s time to fetch the photos from the user’s photo library. 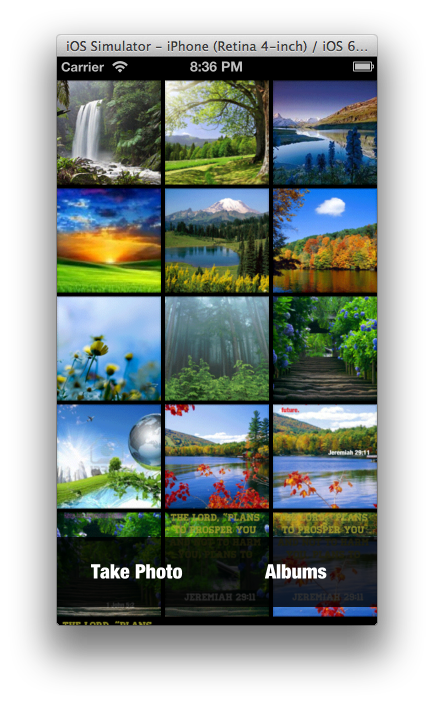 If you are using the simulator, make sure to populate the Photo Gallery with images from the web. Simply open up a browser, do a Google Image Search, and click and hold on various images. You should have an option from the menu that pops up to save the images to your camera roll. Finally, open up the Photos app on the simulator to initialize the Assets Library. 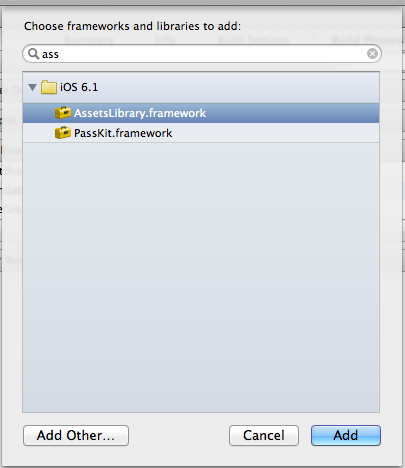 In order to interface with the user’s photo library, we must first import the AssetsLibrary.framework framework. To do this, click on your project in the sidebar, select the Target, then click Build Phases, expand the Link Binary With Libraries section and click the + button. Do a search for Assset and then double click on AssetsLibrary.framework. Before we can fetch the user’s photos, we need to set up an NSArray to put them in. Add the following line within the @interface declaration at the top. This is a static method that creates a static instance to the ALAssetsLibrary. The reason this is needed is, when we enumerate the ALAssets in the next method, it seems that the assets get released immediately and otherwise wouldn’t be able to be used in the rest of the application. I will explain this a little more in a moment. Sort the assets list by date (this won’t work yet, but I will show you how to fix later). For now this code is commented out and the Assets will be sorted however they come out. Now that we have an NSArray populated with ALAssets, let’s set up the delegate methods for the UICollectionView in order to populate it with data. 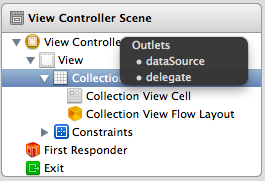 A UICollectionView functions much like a UITableView having delegate and datasource methods. Add the following methods to your ViewController class to populate the view. This code should be fairly straight forward if you have ever worked with a UITableView. 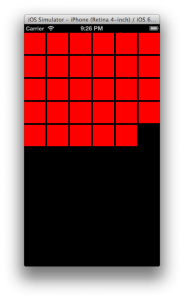 The only lines to note are where ‘cell.asset = asset’ is commented out and we set the cell’s background color to red. We will uncomment that line when we create a custom cell to display the image (for now it won’t). I have also set the background color to red so that you can see that the number of cells is actually corresponding to the number of photos in the camera roll. Let’s take a break to do a build and run to see what happens. If you have hooked everything up correctly, you should see a black screen with red squares on it with a count equalling the number of photos in the user’s library. Not too exciting, however it shows that we are displaying a number of cells corresponding to the number of photos in the user’s asset library. At least it’s showing that you have done something. The next step is to create a custom UICollectionViewCell that actually displays the photos, which we will do next time. That’s all for today. In a ploy to get you to come back to my site (and subscribe to my RSS feed), I have chosen to break this post up into two parts. Luckily for you, I wrote the above message a while ago. Click the link below to go to part 2!